The benefits of fermenting or aging wine in toasted oak barrels are indisputable and unmatched by any other type of wood. Not only do oak compounds impart aromas and flavors as well as body and structure, they also help improve wine color and stability. White oak of the Quercus genus is almost exclusively the only type of wood used in barrel making because of its affinity for wine. But there is a plethora of Quercus species from many regions of the world to choose from, each having different characteristics and therefore imparting different aromas, flavors, and mouthfeel, which are influenced by such factors as regional forest climate, age of trees, and tightness of wood grain. Q. robur is the most widespread species in Europe while its subspecies Q. sessilis and Q. pendunculata are most often used for premium French barrels, and Q. alba is predominantly used for American and Canadian barrels, which tend to impart more “oakiness.” We’ll see why. Organoleptic profile is also greatly influenced by production methods, namely, how the wood is milled (split vs. sawed), how it is dried (air vs. kiln) and for how long, and the extent of toasting (light vs. medium vs. heavy). This means that oak compounds transferred to wine can have dramatically different characteristics and chemical behaviors that will impact wine chemistry and quality and how it evolves and changes over the period wine is aged in barrels. Raw, untreated oak wood comprises non-volatile compounds, that is, those that we cannot smell but which may impact flavors and mouthfeel, and volatile compounds, that is, those that we could smell if above detection threshold and in sufficient concentration. The most significant non-volatile compounds include: the polysaccharides cellulose and hemicellulose which together with lignin make up the complex, strong woody matrix of tree trunks; astringent and bitter-tasting hydrolyzable tannins present in high concentrations; coumarins; gallic acid; and harsh condensed tannins but which exist in relatively small concentrations. Cellulose is a very large polymer of glucose where the high number of hydroxyl (OH) groups can form many hydrogen bonds (with adjacent oxygen-containing molecules) to give wood its structural strength. Hemicellulose is a shorter polymer of glucose and many different sugar monomers form hydrogen bonds with cellulose. And lignin fills the spaces in the cell wall between cellulose, hemicellulose and pectin components. Cellulose undergoes relatively little change during seasoning and toasting and therefore has little impact on wine chemistry. But hemicellulose and lignin contents are much reduced with increasing levels of toasting. High concentrations of hemicelluloses could otherwise be a source of acetic spoilage with increasing risk as barrels get older. That’s because hemicellulose contains acetyl compounds having acetic-like structures that can hydrolyze into acetic acid and cause volatile acidity (VA). Hydrolyzable tannins are so-called (though mainly for historical reasons) because they can be hydrolyzed, or split, into their gallic and/or ellagic acid and glucose components. Those tannins from gallic acid are known as gallotannins and those from ellagic acid as ellagitannins. The class of ellagitannins is the more significant of these two and, specifically, castalagin and vescalagin are the most important ellagitannins derived from oak wood. Coumarins are derivatives of the sweet-scented, bitter-tasting coumarin compound found in some plants and wood. Coumarins in oak wood include bitter-tasting scopoline and esculin, compounds which are found bound to sugar components but which then hydrolyze to the more neutral tasting scopoletin and esculetin compounds. European oak is known to have higher concentrations of ellagitannins and coumarins compared to American oak. Harshness and bitterness are exacerbated by gallic acid (a phenolic acid) content, which contributes an acidic taste, and you’ll recall that acidity enhances bitterness. But you’ll also notice that hydrolyzable tannins and coumarins can impart that familiar oak sweetness because these compounds can hydrolyze and release sugar molecules. But beware! Sugar can also become a source of food for spoilage microorganisms if wine is not adequately protected against these intruders. Such spoilage in barrels can be difficult, and even impossible, to eradicate. The most significant volatile compounds include: long straight-chained and phenolic (cyclic) aldehydes; volatile phenols; and oak lactones. Aldehydes constitute a class of compounds that include many familiar volatile and oxidation-prone substances such as acetaldehyde (ethanal), which is found in oxidized wine and easily identifiable by its distinctive nut-like smell. In raw oak wood, long straight-chained aldehydes include high concentrations of trans-oct-2-enal, trans-non-2-enal, and decanal, 8, 9 and 10-carbon aldehydes, respectively, which together are responsible for the odor known as plank smell. Phenolic aldehydes are characterized by a closed-ring chemical structure; the most significant is vanillaldehyde, commonly referred to as vanillin, which is responsible for imparting vanilla-like aromas. Other less significant phenolic aldehydes include syringaldehyde, coniferaldehyde and sinapaldehyde; however, these will only play an important role in toasted oak. Volatile phenols include compounds that are most often associated with toasted oak, but in raw wood, there is only eugenol, which is responsible for aromas of cloves, and to a lesser extent, phenol. And then there are oak lactones, namely, methyloctalactone and its variants, which are found in higher concentrations in American oak. These are responsible for sweet, spicy, woody, fresh, leather, and coconut aromas. Let’s now examine how these compounds are affected when wood is seasoned and toasted. Oak destined for barrel-making must be seasoned-artificially or naturally-to reduce excessive humidity, undesirable aldehydes, and harsh ellagitannins. In artificial seasoning, oak planks are heated in an oven (kiln) at approximately 50 °C (122 °F) for up to one month. This is a quick and economical way of seasoning oak but it is considered far less inferior to natural seasoning because artificial seasoning does not suppress or remove as much of the undesirable components. Kiln-dried wood also has a higher content of astringent tannins and bitter coumarins, contains less eugenol, vanillin, and methyloctalactone. It may also lead to more shrinkage cracks in barrels, which may then cause problems, such as seepage, especially around the bung area. 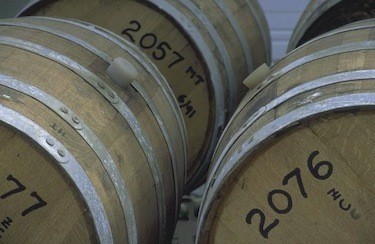 The best barrels — and most expensive — are coopered from two- or three-year air-dried wood, which increases concentrations of aromatic compounds, namely eugenol, syringic and vanillic aldehydes produced by the breakdown of lignin, as well as methyloctalactone, and a decrease in plank-smelling aldehydes. Castalagin, vescalagin and coumarins also undergo hydrolysis, reducing the astringent and bitter-tasting content. But the most dramatic structural and chemical changes in the wood occur with toasting where the inside barrel surface is set over a fire. There is a commensurate increase in phenolic aldehydes and ketones and substantial production in guaiacol and syringol and their respective derivatives, all responsible for the smoky, spicy aromas. Interestingly, while guaiacol and syringol levels increase with more toasting (although 4-methylguaiacol and 4-allylsyringol decrease with heavy toasting), phenolic aldehyde and eugenol levels decrease from medium to heavy toasting. Heavy toasting also introduces little cresol, which impart a tar-like smell, 4-ethylguaiacol and 4-propylguaiacol, responsible for bacon, spice, clove or smoky aromas, as well as ketones derived from hexoses in the presence of nitrogen-containing substances (Eggers, 2006). These ketones include cyclotene, maltol and isomaltol, which can add aromas of freshly baked bread and caramel. Toasting also increases the amount of oak lactones responsible for flowery, spice, coconut aromas though the incremental effects of heavy vs. medium toasting are not significant. Toasting also introduces a new subclass of compounds known as furfurals or furanic aldehydes, which are again derivatives of aldehydes but containing a cyclic structure similar to phenolic aldehydes but where a carbon is replaced by an oxygen atom in the ring. Volatile furfurals include 5-hydroxyfurfural, which imparts caramel, bread and almond aromas, and 5-methylfurfural, which imparts notes of toasted almond. Barrel aging and barrel fermentation are not the same; their chemistry and impact on wine are very different. In barrel aging, wine undergoes slow and progressive micro-oxygenation whereby an infinitesimally small amount of air enters the barrel through the tight but porous wood structure as well as through the stave and head joints. During this slow maturation period, oxygen binds to polyphenols and causes what is interpreted as softer tannins. And we also know that oak aging — specifically, toasted oak — stabilizes pigments, thereby stabilizing color as tannins bind to anthocyanins. In barrel fermentation, there is a high population of very active yeast cells assimilating aromatic oak compounds and tannins. When wine is later racked from its lees, and particularly when fined and/or filtered, yeast cells are separated out, taking those compounds out too. Yeast cells can also alter some of these compounds and translocate them back to the wine; for example, ferulic acid, a phenolic phytochemical found in wood cell wall components, can be converted into 4-vinylguaiacol and impart clove-like properties (Zoecklein et al., 1999). Vanillic and furanic aldehydes are also reduced into their odorless alcohols. The result is that barrel-fermented wines will exhibit more subtle oak features than oak-aged wine without prior barrel fermentation. Additionally, polysaccharides and mannoproteins (proteins bound to mannose, a 6-carbon sugar) in the cell walls of yeast are partially released into the wine during fermentation as enzymes start breaking down those cell walls. Polysaccharides will bind to polyphenols in whites and specifically anthocyanins in reds to reduce but stabilize color. Mannoproteins bind to wood tannins to make wine more supple and less astringent with a creamier mouthfeel, and also improve protein stability and therefore reduce the risk of downstream problems, particularly post-bottling cloudiness. This process continues during sur lie (on the lees) barrel aging in what is known as autolysis and which further improves the organoleptic profile by imparting bread-like, yeasty aromas. Interestingly, sur lie oak-aged wine previously barrel-fermented showed lower concentrations of vanillin (Margalit, 2004) and furanic aldehydes (Zoecklein et al., 1999). Remember to periodically stir the lees back into suspension to reduce the risk of sulfur-containing odors (e.g. hydrogen sulfide, H2S) forming. Also, as the overall tannin and polyphenol concentrations decrease, wine becomes more prone to the effects of oxygen as less polyphenols are available to bind with damaging oxygen radicals. So what type of barrel should you buy and use? That would be like asking what type of car I would recommend for you; it all depends on your budget and your objectives. But as a general guideline, budget notwithstanding, 3-year medium toast barrels are the safest bet. Then, you need to balance the needs of the wine to the style you want to create and match that to a barrel type. For example, if you want to introduce more oak lactones into your wine without long aging, American barrels would be a good choice. Experiment, learn, and adapt your barrel winemaking. You may also want to have different types of barrels and then blending wines from different barrels; or try aging wine in one type of barrel and then transfer it to another type. Eggers, Nigel. “The Contribution of Oak.” Biochemistry of Wine. (June 2006). https://people.ok.ubc.ca/neggers/Chem422A/. Margalit, Yair, Ph.D. James Crum, Ph.D., ed. Concepts in Wine Chemistry. New Edition. South San Francisco, CA: The Wine Appreciation Guild, 2004. Zoecklein, Bruce W., Kenneth C. Fugelsang, Barry H. Gump, and Fred S. Nury. Wine Analysis and Production. Gaithersburg, MD: Aspen Publishers, Inc., 1999.